Twisted Central: Someone's Knocking at the Door Director Chad Ferrin Needs Your Help! Someone's Knocking at the Door Director Chad Ferrin Needs Your Help! Horse is an action packed Western written and directed by Chad Ferrin (Unspeakable, The Ghouls, Someone's Knocking at the Door). 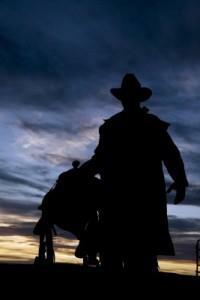 In the Old West, a man relies on two things to survive - his gun and his horse. And Luther Cobb just lost one of those, his beloved horse, Bud. Cobb is a man of true grit, having fought in the Civil War and skirmishes in the American Indian Wars. He has seen plenty of blood shed and is now on the trail of those responsible for killing his friend. The film is a collaborative effort by producers Mike Leahy (Pulse, Feast, Drive) and Jeff Olan (Rock of Ages, John Dies at the End) to fund a project outside of the studio system. Ferrin is partly financing the bulk of the film in order to maintain complete creative control of the project. According to Ferrin, “I believe in "Horse" heart and soul, and I'm willing to put everything on the line for it". The Horse team realized that Kickstarter is an amazing new tool for the independent filmmaker, and is seeking to connect with fans, cinefiles, artists and art lovers with this campaign. Raising money will help in the production of the film in addition to increasing awareness of it. There is a distinct value in having an intimate relationship to those who care about art, and we are grateful to Kickstarter for helping these relationships grow.